I gave away an extraordinary amount of clothing during our Great Purge. One of my criteria was to keep no boy clothes smaller than my smallest boy. Since Nicholas is larger than Stephen, my smallest boy is nine years old. I figured that even if we had another baby and that baby was a boy, the clothes would be at least ten years old before the baby wore them. Most of them would be older than that. And little boys aren't particularly gentle on their clothing. So, out it all went. Except for the blue blazers. I didn't give away any of those. I like the way they look, hanging there in the closet. They are a family history. They are First Communions, Easters, Christmases, Confirmations, and siblings' baptisms. They are weddings and feast days and funerals. I couldn't bear to part with a single one. 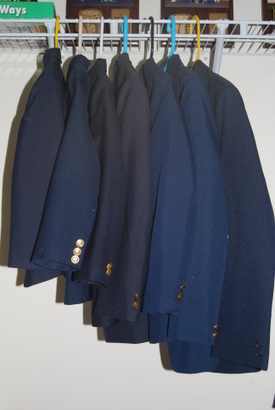 And my husband reassures me that blue blazers are classic enough that there's no need to let them go. He says our grandsons can wear them some day. There's something comforting and optimistic in that idea.